Off-road triathlon. Open-water swim, mountain bike, trail run. Off-road riding and running is a whole different set of challenges and skills. The terrain is constantly changing, you're right in the middle of nature (often covered in it!). It's tough physically, mentally, and everything in between (metaphysically?). 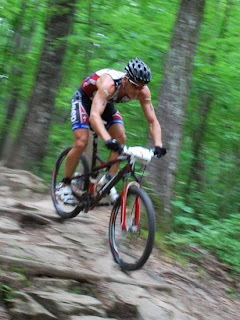 Why I'm glad you asked - we actually have two multisport Xterra events in Ontario now! The details are on the Element Racing site. What about you, Mr. Marshmallow Man to Ironman? ... so I will love Xterra! Everything that I'm interested in, one event. Can't wait. That sounds awesome! Too bad both of those weekends are taken. Hope they do more events in the future.